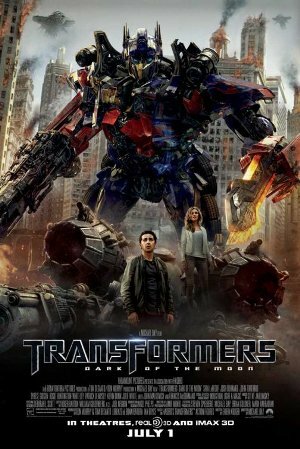 One thing's for sure, "Transformers: Dark of the Moon" is the best film in Michael Bay's "Transformers" trilogy. It successfully delivers a complete package that the two other films failed to do. This looked epic from the get-go and indeed it was epic in every sense of the word - it completely blows its predecessors away. Although the film was deeper, darker and more serious, it never forgets to be fun (a trademark of the series) and yet, the film also forgets to remove the bad elements that made the other two films imperfect. Read on for the full written review of "Transformers: Dark of the Moon". In 1961, an alien ship, The Ark, (the last ship to leave Cybertron) crashes into the dark side of the Moon. NASA takes notice and this sparks the lunar program. Apollo 11 successfully takes samples from the alien ship. Today, the Autobots and the Americans have teamed-up to prevent humans from destroying each other. While on a mission in Chernobyl, they discover that an engine part of The Ark was experimented by the Russians (and actually caused the nuclear meltdown in 1986). Optimus Prime reveals the significance of The Ark and the devices it whisked away from Cybertron. In it were Pillars when joined together creates a space bridge which teleports matter from one place to another. The ship also contained their former leader, Sentinel Prime. On a mission to the Moon, Optimus Prime is able to save Sentinel Prime but bad news strikes as their are only 5 Pillars left (out of hundreds). The Decepticons have pillaged the other Pillars and the Autobots and humans must do everything they can to stop the Decepticons from completing the space bridge. The biggest problem and at the same time the biggest asset for "Transformers: Dark of the Moon" is Michael Bay himself. The guy has his own style and like the previous films, it bares itself without shame - warts and all. The film actually feels a little too similar to the previous films. The pacing was messy and convoluted as usual - one minute its serious and brilliant and the next minute the film throws you off with an unnecessary one-liners. With a running time of 2 and a half hours, we really felt that some scenes were dispensable. The sloppiness is more obvious this time around as the plot actually has meat. As expected, the film was mind-blowing in terms of its action sequences and in our opinion, one of the very few films that fully utilizes 3D and worth watching over traditional 2D. "Transformers: Dark of the Moon" combines fun and a great story line which makes it the best of the bunch and a definite watch.